[16:43] So, ask the people (having the knowledge) of the Reminder, if you do not know. This question pertains in its entirety to United Kingdom, its Government policies and ingredients of vaccinations being used in UK. This research was conducted from April-June 2014. Caution is advised when using this research and ensuing response for citizens of other countries excluding United Kingdom and any changes subsequently implemented since June 2014. The British Government has produced the Green Book which has the latest information on vaccines and vaccination procedures, for vaccine preventable infectious diseases in the UK. The Green Book is periodically updated as and when necessary with the current update being done on the 18th of March 2014. Although there is fierce debate within the professional community in Britain, vaccination isn’t mandatory in United Kingdom but it is strongly advised and readily available. Consent is required before the administration of all vaccines, even the most vulnerable cannot be force vaccinated against their explicit consent or that of their parents/legal guardians. Information, vaccination data and ingredients are easily available through the GP (Doctor) or online (eMC). In order for a parent to make an Islamic decision a list of excipients will also be provided. Excipients are inactive ingredients in a vaccine added during the manufacturing process of pharmaceutical products. A conjugate vaccine is the one in which specific sugars (polysaccharides) from the bacteria are joined to a protein (non-toxic derivatives of either tetanus or diphtheria). This is done because the sugars alone are not effective in producing an immune response in infants and children. It contains a small amount of aluminium salts which act as an adjuvant, strengthening and lengthening the immune response to the vaccine. New born babies are born with low amounts of Vitamin K in their blood which is needed to clot the blood in the body. New born babies are offered an injection or oral (drops) but administration of drops is a hit and miss as many babies spit it back out! 4 Hydrochloric acid Ph. Eur. 5 Water for injection Ph. Eur. Vitamin K administration to new born babies has been done since 1944 in the West. 1 Diphtheria: The bacteria that causes diphtheria makes a harmful protein, called a toxin. People who develop an immune response to this toxin are protected against the disease. The diphtheria vaccine is made by taking the diphtheria toxin and inactivating it with a chemical. 4 Polio: It includes IPV (inactivated polio virus) which, being inactivated, carries no risk of causing paralytic polio (which was a very small risk with the live, oral polio vaccine used in the UK until 2004). It is a conjugate vaccine, in which specific sugars (polysaccharides) from the bacteria are joined to a protein (in this case, a non-toxic derivative of diphtheria). This is done because the sugars alone (as used in the adult Pneumococcal Polysaccharide Vaccine) are not effective in producing an immune response in infants and children. It contains a small amount of aluminium phosphate which acts as an adjuvant, strengthening and lengthening the immune response to the vaccine. This vaccine gives protection against type A rotavirus infections that cause vomiting and severe diarrhoea in infants and children. This vaccine is given at 2 months and is a live human rotavirus that has been weakened (attenuated). As it is an oral vaccine, it also contains about a gram of sugar (sucrose) to give it a pleasant taste. This vaccine gives protection against meningococcal disease (a major cause of meningitis) caused by group C Neisseria meningitidis bacteria. In the UK, it is given to babies aged 3 months. The vaccine is inactivated, and cannot cause the disease itself. It is a conjugate vaccine, in which specific sugars (polysaccharides) from the bacteria are joined to a protein (non-toxic derivatives of either tetanus or diphtheria). This is done because the sugars alone are not effective in producing an immune response in infants and children. It contains a small amount of aluminium salts which act as an adjuvant, strengthening and lengthening the immune response to the vaccine. 1 Diphtheria: The bacteria that causes diphtheria makes a harmful protein, called a toxin. People who develop an immune response to this toxin are protected against thedisease. The diphtheria vaccine is made by taking the diphtheria toxin and inactivating it with a chemical. This vaccine boosts protection against meningococcal disease caused by type C Neisseria meningitidis bacteria, and against Hib disease. It is given at 12-13 months in the UK schedule to children who received initial doses of the vaccines in the first year. It is a conjugate vaccine in which specific sugars (polysaccharides) from the Hib and MenC bacteria are joined to a protein (in this case, a non-toxic derivative of tetanus). This is done because the sugars alone are not effective in producing an immune response in infants and children. This vaccine gives protection against measles, mumps, and rubella. A first dose is given at 12-13 months in the UK schedule. The vaccine contains live, but weakened (attenuated) strains of the measles, mumps and rubella viruses. In most countries this vaccine contains gelatin derived from pigs but the brand name below DOES NOT! This vaccine gives protection against certain types of the Human Papillomavirus (HPV), including those types which cause cervical and mouth cancers.It protects against four types of HPV: type 16, which causes oral cancer and, together with type 18, is responsible for over 65% of the cases of cervical cancer; and types 6 and 11, which together are responsible for around 90% of the cases of genital warts. The vaccine does not contain live organisms and cannot cause the diseases it protects against. It contains proteins derived from the viruses, which mimic the structure of the virus, and produce an immune response. It contains a small amount of an aluminium compound which acts as an adjuvant, strengthening and lengthening the immune response to the vaccine. This vaccine boosts protection against the following diseases: tetanus, diphtheria, and polio. It is given between the ages of 13 and 18 years in the UK schedule (10-15 years after the Pre-school Booster, which is routinely given at 3 years and 4 months). Compared to the early childhood vaccines, it contains a lower dosage of the diphtheria vaccine (indicated by the small ‘d’ in the vaccine title). The adolescent immune system is able to respond to this reduced dose since it remembers the previous doses, and the side effects are reduced as a result. 3 Medium 199 which is is a complex medium of amino acids, mineral salts, vitamins, polysorbate 80 and other substances diluted in water for injections. The flu vaccine is available each year from Autumn onwards. The predominant strains change each year, so a new vaccine must be prepared annually. Vaccination from previous years is unlikely to provide wide-ranging protection against the current strains of the virus. 1 Fluarix is indicated in adults and children from 6 months of age as Prophylaxis of influenza, especially those who run an increased risk of associated complications. 2 Fluarix Tetra is indicated for active immunisation of adults and children from 3 years of age for the prevention of influenza disease caused by the two influenza A virus subtypes and the two influenza B virus types contained in the vaccine. Annual revaccination with the current vaccine is recommended because immunity declines during the year after vaccination, and because circulating strains of influenza virus might change from year to year. 9 and water for injections. The UK is gradually introducing annual flu vaccination for all children aged 2-17 years old. The aim is to protect children and also people around them, particularly those at risk of complications of flu. If children get flu they can remain infectious for longer than adults (up to two weeks), and they are also more likely to pass on the infection, so protecting them is a good way to protect others in the community. The vaccine contains live, but weakened, forms of flu virus which do not cause flu in those vaccinated. The virus is grown on fertilised hens' eggs and the vaccine may contain residues of the egg proteins (e.g. ovalbumin). The vaccine is no longer given to all children as part of the schools vaccination programme. Instead there is now an improved programme of targeted vaccination for those individuals who are at greatest risk of contracting the disease. The main risk groups are infants under one year of age living in areas where the incidence of TB is 40 cases per 100,000 people or higher, infants under one year of age whose parents or grandparents were born in a country with an incidence of TB of 40 cases per 100,000 people or higher, and new immigrants from countries with a high incidence of TB who have not already been vaccinated. The BCG vaccine contains a live but weakened form of Mycobacterium bovis, which is the bacterium that causes tuberculosis (TB). (The vaccine is known as BCG because a strain of the bacterium known as Bacillus Calmette-Guerin is used). It is a vaccine against tuberculosis that is prepared from a strain of the attenuated (virulence-reduced) live bovine (cow) tuberculosis bacillus, Mycobacterium bovis, that has lost its virulence in humans by being specially subcultured in a culture medium. There are two brands in UK and both are conjugate vaccines. 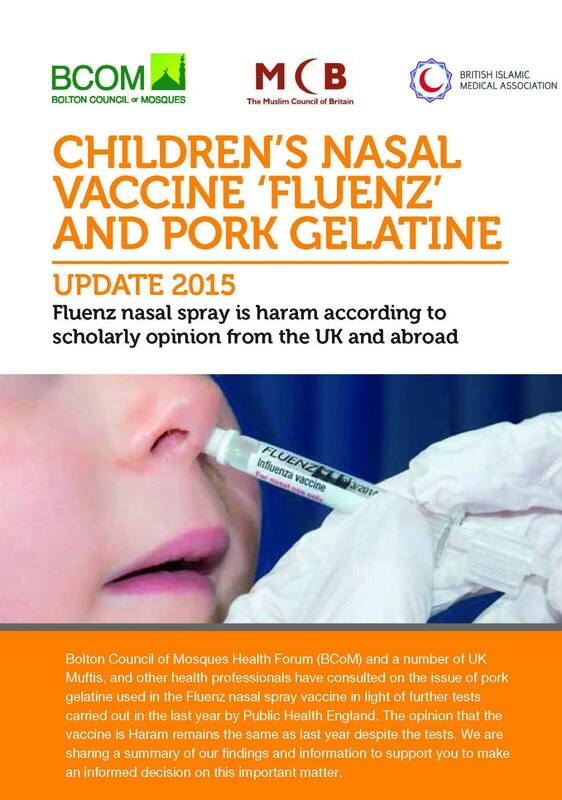 In my considered professional opinion the nasal vaccine (Fluenz) containing porcine derived gelatine referred to in the question is not suitable for Muslims. Ihave read through the entire information you have provided and heavily contemplated on it as well. In my view the most important information in the entire page is "Consent is required before the administration of all vaccines, even the most vulnerable cannot be force vaccinated against their explicit consent or that of their parents/legal guardians." This gives a great leverage for Muslim parents to choose what they wish to administer their children. Other than this, the issue is simple. 1 Those vaccines which do not have haram ingredients: These can be administered without question. However, as a caution a qualified muslim doctor should be consulted in scheduling these vaccinations. 2 Those vaccines which contain porcine or other haram ingredients: Since they are essential, a qualified muslim doctor MUST be consulted. The Muslim doctor should seek out any alternatives which are suitable. 3 If there are no suitable alternatives available then the doctor should be consulted whether the need of those vaccine is integral life of the child or not. In this case if it is integral, the vaccine may be administered, even if it has haram ingredients. However, if it is not integral to the life of the child or severe deformity in growth etc., then it should be avoided. If there are alternatives available, then those alternatives should be adopted. If the vaccine is not essential rather a mere preventative recommendation, then it should be avoided. The rules which will govern all such matters are same as "Tadawi bil haram".